Backpressure is created by exhaust flow entering the housing, hitting the closed butterfly valve and being forced back out in the direction it came. It is maintained by the calibrated spring that is located on the outside of the exhaust brake housing. 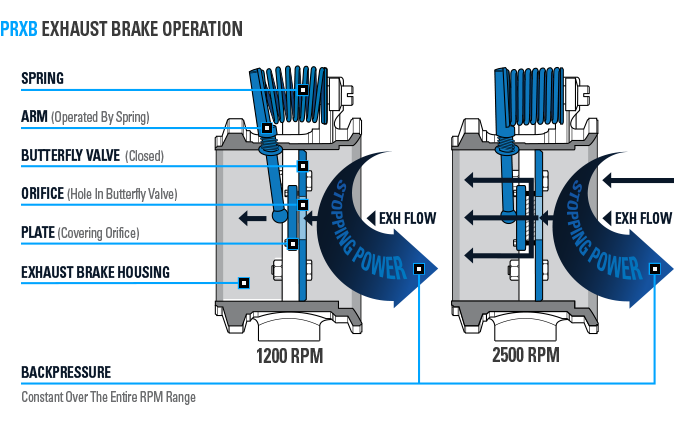 As the engine’s RPM increase, the spring compresses and the arm moves away from the butterfly valve, releasing more exhaust flow through the orifice. As the RPMs decrease, the spring extends and the arm moves the plate, which covers the hole, and ultimately allows a smaller amount of exhaust flow past.